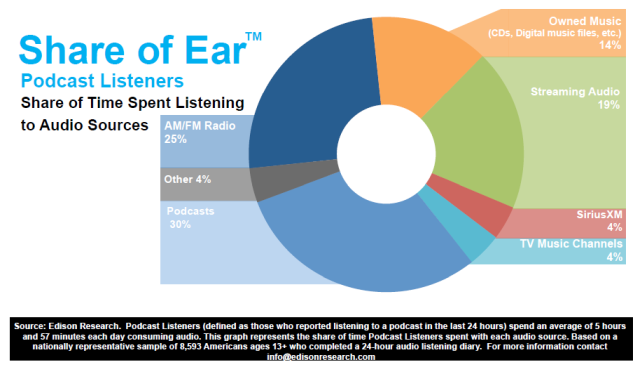 Edison Research produced its Podcast Consumer 2017 webinar today, revealing survey information from Edison’s two large, long-running studies of American listening, The Infinite Dial and Share of Ear. Edison VP Tom Webster presented over 30 minutes of survey statistics. As noted in the March Infinite Dial webinar, survey respondents who have listened to a podcast in the past week reached 15%, an estimated 42 million. 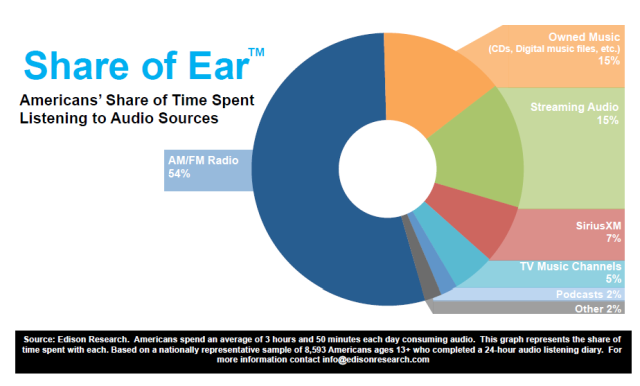 Among those weekly listeners, average time spent listening to podcasts was between 1 and 3 hours for 36%. For 22%, the average time was between 3 and 5 hours. Those weekly listeners were keeping up with an average of five podcasts in the past seven days. The average time spent with the format for weekly podcast listeners is 5 hours, 7 minutes. That crunches out to about an hour per show. The presentation broke out more detail on smart speakers, which are an emerging technology for home listening. For the average population, 7% of respondents own either an Amazon Echo or a Google Home device. 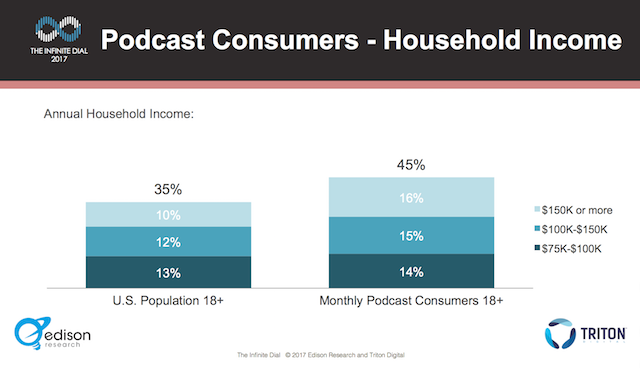 Among the respondents who are monthly podcast listeners, however, the rate is 11%. Those few percentage points seem like a compelling trend at this early stage in the product category’s life. 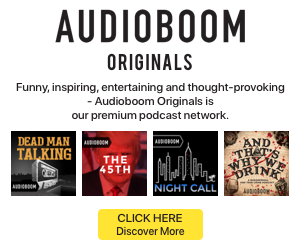 “It is a real opportunity for podcasting,” Tom Webster said. 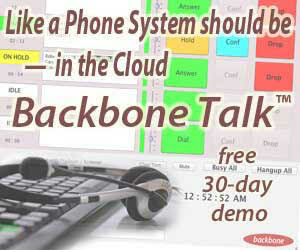 However, he cautioned that “discovery on a device with no screen is even more of an issue” than on existing platforms. Webster also issued a general advisory about content discovery, underlining a difference between “pushed” and “pulled” content, and the tremendous advantage of leverage marketing. 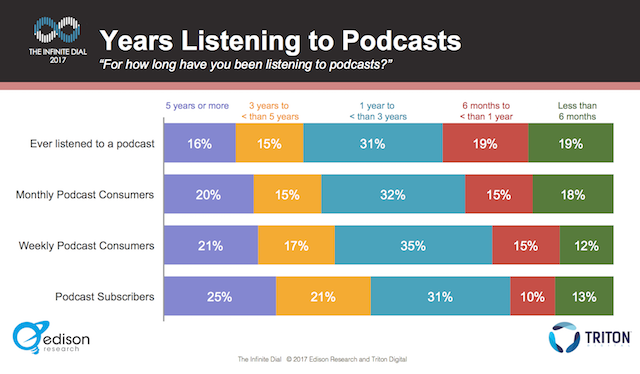 One of the most intriguing slides tracked how long different types of listeners have been tuning in to podcasts. Across all types, between 1 and 3 years was the most common response. But for podcast subscribers, a quarter have been listening for 5 or more years, and 21% have been listening for 3 to 5 years. That shows a surprisingly stalwart contingent of listeners who have been involved from before the current wave of podcast popularity and growth. what an amazing information .